A common and important morphologic abnormality of neutrophils is so-called “toxic change“. Contrary to what has been written in many books, toxic change in neutrophils is not necessarily associated with “toxemia”. The term derives from the fact that these abnormalities were first noticed in human patients with gram negative sepsis and endotoxemia. However, toxic change in neutrophils do not reflect a “toxic effect” of bacteria on neutrophils but are morphologic abnormalities acquired during maturation under conditions that intensely stimulate neutrophil production and shorten the maturation time in the bone marrow. This accelerated maturation occurs secondary to cytokine stimulation, which is usually in reponse to inflammation. Animals recovering from bone marrow injury or who are administered hematopoietic cytokines (e.g. granulocyte-colony stimulating factor or G-CSF) can also show accelerated maturation in neutrophils or toxic change. On the standard hemogram, the presence of toxic change is reported under the WBC exam section and is subjectively graded as mild, moderate and marked. Most of the toxic changes reflect asynchrony of maturation between the nucleus and cytoplasm. During normal granulocytopoiesis, the lengthening and pinching of the nucleus are coordinated with progressive condensation of the chromatin and loss of cytoplasmic protein synthetic machinery (RNA in the form of ribosomes and rough endoplasmic reticulum – which imparts a blue color to the cytoplasm with hematologic stains). With accelerated maturation, nuclear divisions may be skipped (resulting in larger cells than normal) and the cells retain immature features, including increased amounts of rough endoplasmic reticulum or ribosomes in the cytoplasm and lighter chromatin than normal. Specific granules may be less visible than in normally mature cells and, in some species, primary granules (normally inapparent in neutrophils) retain their affinity for the stains used for peripheral blood. The cells can also have frothy or vacuolated cytoplasm. Cytoplasmic basophilia: A streaky diffuse irregular blue appearanceto the cytoplasm. It is due to the presence of polyribosomes and rough endoplasmic reticulum. Döhle bodies: These are pale round to linear blue aggregates in the cytoplasm, caused by whorls of rough endoplasmic reticulum (see image to the right). This is often the earliest and first indication of toxic change. However, note that healthy cats can have low numbers of small Döhle bodies and we have observed that Döhle bodies form in neutrophils with storage – this was by comparing freshly made blood smears to blood smears made from the submitted stored blood in our laboratory (storage-related artifact, for images of this, see blood artifacts under the hematology album). Thus, Döhle bodies alone do not always indicate toxic change. Cytoplasmic vacuolation: These are indistinct vacuoles in the cytoplasm, giving it a frothy appearance and is due to degranulation of lysosomes. 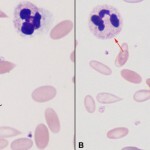 Note that clear punctate vacuoles are usually not attributed to toxic change, but are frequently another storage-related artifact (these vacuoles can occur within 4 hours of blood collection). Nuclear immaturity: The nuclear chromatin is lighter (finer) and less coarsely clumped than normal. This is the hardest and most subtle change to see. Toxic granulation: These are distinct red granules in the cytoplasm due to the primary granules taking up stain. This is a rarely seen feature in domestic animals, but is most commonly seen in large animals (horses, ruminants, camelids – see image below). Toxic granulation in a camelid with enteritis. Because toxic change usually indicates an inflammatory leukogram, it frequently accompanies a left shift, i.e. 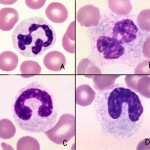 presence of immature neutrophils (bands, metamyelocytes, myelocytes), in animals. However, some animals can have a left shift without toxic change (e.g. some dogs with immune-mediated hemolytic anemia) and toxic change can be present (albeit rarely) in animals without a left shift. In the latter circumstances, we look for reasons other than inflammation for the toxic change (e.g. marrow dysplasia, storage artifact). The degree of toxic change can also be a helpful finding. The more severe the toxic change, the more intense the inflammatory stimulus. In one prospective study of 105 horses presenting to an emergency clinic with medical or surgical colic, the presence of bands and moderate to severe toxic change were associated with decreased survival (Lambert et al 2016).